On January 12, 2010, a devastating earthquake with a magnitude of 7.3 struck Haiti, killing more than 220,000 and displacing close to 1.5 million people. The earthquake caused severe damage to houses, schools, churches and hospitals, with many sports facilities also being destroyed. Foreign governments, charities and not-for-profit organisations co-ordinated the provision of humanitarian aid for the people of Haiti. In 2010 the BWF and Peace and Sport signed an MOU outlining shared goals to encourage peace and social cohesion through badminton. BWF announced its commitment to provide expert trainers, resources and equipment to support vulnerable youth in regions of the world that have been affected by natural disasters, war, severe economic circumstances and social unrest. • Developing a local workforce to deliver badminton in schools and communities. 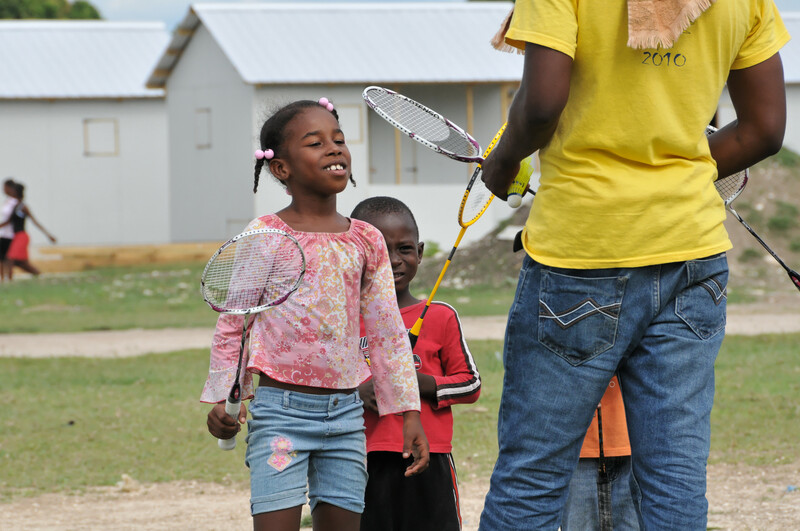 • Creating opportunities for children in Haiti to be active and experience fun through badminton. • Providing badminton equipment to support the teaching of Shuttle Time sessions. • Introducing a schools badminton competition. • Supporting the growth and development of the Haitian Badminton Federation. to access and experience sport. Because the Shuttle Time programme was already established, structured badminton was selected as one of the sports offered at the centre. Furthermore the Sport for Hope Centre provided the Haitian Badminton Federation a work station and materials to administer badminton nationally from the centre. This new partnership and facility together with the training of Shuttle Time tutors is a key factor in the sustainability of the programme. Mr. Hans Larsen, President, National Olympic Committee of Haiti.